Looking to stay somewhere special for your next vacation? Look no further – you’ve found the Mission Beach Solstice, an amazing detached home located right in the middle of the most desirable part of Mission Beach. Situated on the strand right between the beach and bay, this unique vacation rental exudes a feeling of home no matter who you are or where you live. This is not your typical beach house. From top to bottom and inside and out, the home was custom-built using the finest in natural materials to create a contemporary masterpiece. The homeowner-builder traveled extensively in the US, Europe and Asia, which provided the inspiration for this remarkable property. By combining diverse styles, such as the clean lines of Scandinavian architecture with the warm natural materials of Southeast Asian temples, the result achieved is a light, airy and welcoming space where you can’t help but relax the moment you walk in the door. The extensive use of stone, concrete, metal and glass adds weight and drama, and then those materials are fused with a copious amount of custom woodwork throughout to lend warmth and life to the space. The diverse wood species used include oil-rubbed oak floors, expansive Douglas fir window casings, rich mahogany doors and handrails, and solid hardwood cabinetry. The use of extraordinary building materials continues with seafoam green travertine tile with embedded marine fossils, quartzite tile with marble details, tumbled glass inlays and colorful sandstone that is ever changing when interacting with sunlight and shadows. Guests will also appreciate the Green building practices that were used, including the photovoltaic panels on the roof, energy-efficient heat pump and tankless water heater. The climate-appropriate and drought-tolerant garden uses agaves native to Mexico, aloes from southern Africa and California-native echeveria succulents. Attention to detail is everywhere. One-of-a-kind delights to discover include a surfboard over the staircase, made from a redwood spar reclaimed from a northern California water tower; a Douglas fir orca totem made by a Native American chainsaw artist working alongside a Washington highway; and a large kitchen island/table handcrafted from sustainable and locally harvested eucalyptus. The kitchen table is a natural gathering place and it was deliberately placed at the center of the structure. It’s the heart of the home and the lines of the dwelling radiate from there. The open concept living floor on the main (2nd) level features a gourmet kitchen where conversation around the table flows easily and whipping up your favorite dishes is a breeze. Chefs will appreciate the induction cooktop with specialized cookware, convection oven and built-in gas BBQ with pass-through window. The kitchen’s custom-styled cabinetry is offset against a wall of back-painted glass accented with open shelving made of honed marble. The living area is just off the kitchen, and features stylish designer furnishings, including a queen sofa sleeper and a large top-of-the-line flat-screen TV and sound system. This beautiful Mission Beach vacation rental is truly a unique and special retreat. Overall I was very happy with my experience with Bluewater. They were helpful, polite and knowledgeable. Checked in with us after 24 hours to make sure we had everything we needed. 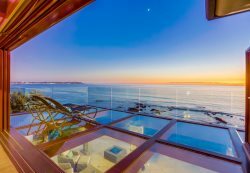 We were looking for a San Diego beaches property for a family get together. We contacted Bluewater and located the perfect spot. The Bluewater team were fast, professional and very helpful to make the booking, arrival and stay feel very comfortable. Their support made the stay everything we hoped it would be and allowed us to focus on our time together. Our family loved our stay at Mission Beach Solstice. The location and property were exactly as advertised. It was close to everything and was a great place to share new memories. Highly recommend this property!